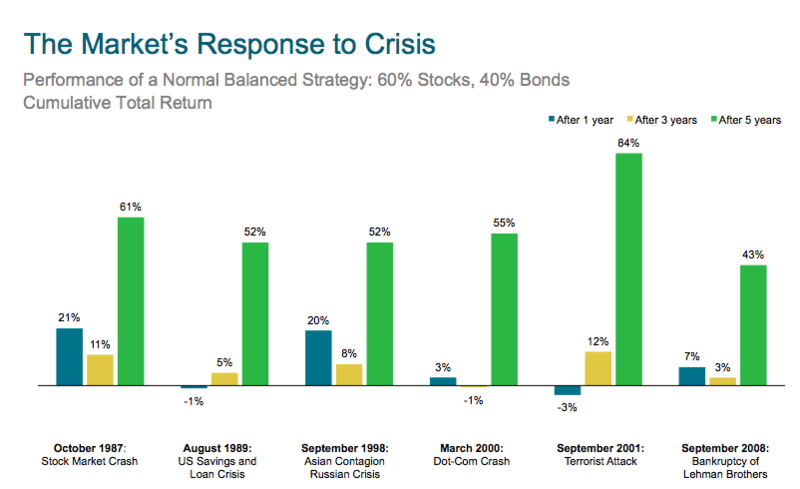 The most important thing long-term investors need to see today is the market’s response to crisis, courtesy of Dimensional Funds. The chart above should put the Brexit in perspective. Nobody knows yet what the implications will be, but I’m pretty confident that this is no more significant than any of the six events above. Now of course there are never any guarantees, that’s what risk means. And if you need the money in the next five years, you should not be subjecting it to the risk of the stock market anyhow. I’m a believer in practicing what I preach, so today in my personal account, I added to the international side of my portfolio. This is definitely not a market call, I am not suggesting the bottom is in, but I also know not to look a gift horse in the mouth. When an entire index falls ten percent in a day, you hold your nose and hit the buy button. Investing is all about giving your future self a chance at a better life, and it’s days like today that determine whether or not you’ll be able to do so via the stock market.